Zarmina can you please explain me that how can we use ict in our lectures while we are giving it to our students??? Abdul Nasir wrote: ict is also help the student in education. schooling and teaching will be forced to change in variety of ways.At one level we now have to teach computer skills,nt least because carrer prospects for our students may be dependent on the possession of such skills.Information and commcunication technology means (ict) made a huge progress in the development our society. but you tell me how ict help the student in education? khuram wrote: fast of all pls tell me education???? education is a reconstruction of previous knowledge . please tell me what is the roll of ict in education? means (ict) made a huge progress in the development our society. samra wrote: Zarmina can you please explain me that how can we use ict in our lectures while we are giving it to our students??? Hina, how can you say that, we save time by using internet? then why do we need to go to the internet, and waste our time there to search for the relevant material? 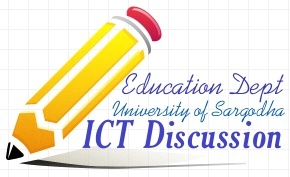 malikfurqan wrote: ict is the easiest way of learning education. Furqan, ICT is the easiest way of learning education? by using of OHP and multimedia and other facilities in our classroom, in the prepration of our lectures and our envoirnmental education. but dont u think, printed media is the cheapest form of the resources, to facilitate the students in the preparation ?? and it makes it easy for both student and teacher..
student buy the printed notes, teacher gives the lectures and students get it by listening to the Teacher and by reading the notes ... !